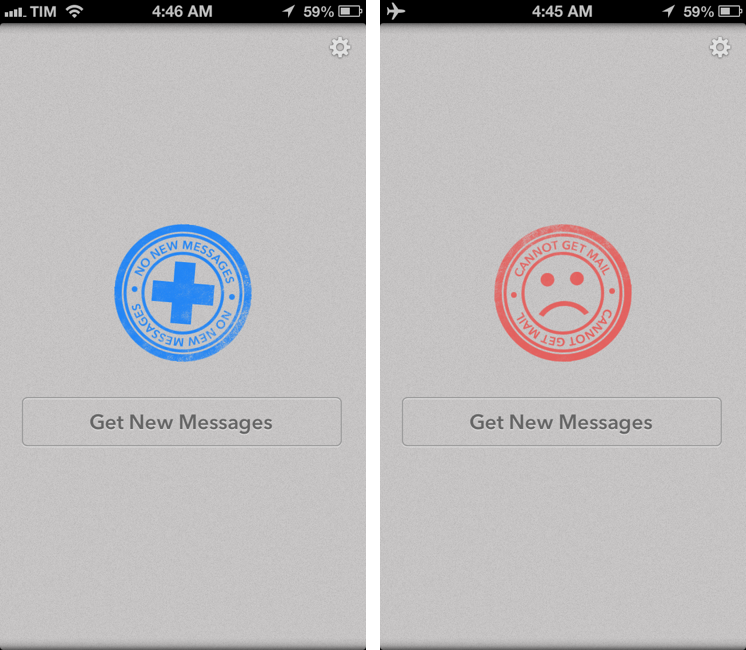 Triage is my new favorite email app for iPhone. I’ve always had a tumultuous relationship with email clients on iOS. It used to be that Apple didn’t like third-party email clients on the App Store, until Sparrow came around. With its superior support for Gmail accounts and a faster workflow for managing the inbox on a daily basis, Sparrow convinced me – in spite of iOS’ limitations – to move away from Apple’s Mail, both on the Mac and iPhone. Until Google bought Sparrow, effectively stalling development on the iPhone and Mac and halting the iPad version’s release altogether. While Sparrow still works, I don’t feel comfortable relying on a product – for a key task such as email – that I know is going to be abandoned eventually. I stopped using Sparrow after it was acquired by Google. I was back to Mail, and I wasn’t too thrilled about it. After upgrading to iOS 6 last year, I lamented numerous times how switching between Edge and 3G networks was worse than iOS 5, and how that behavior affected my Mail workflow due to another ridiculous change Apple made in iOS 6. Mail was my go-to client again, but I often ended up saving emails for later because I didn’t trust iOS 6 to correctly send my messages. 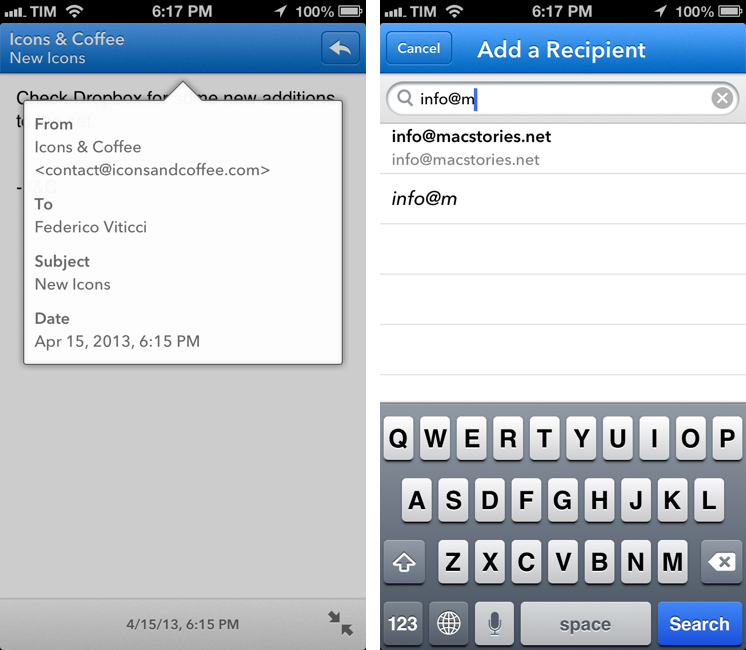 And then Google brought Gmail 2.0 to iOS, a much better version than the original app released in late 2011. I was eager to try out the new universal app with push notifications, once again moving with all my accounts from Apple Mail into a new home, cautiously hoping that would be the last time. I'm still using Gmail for iOS, but there are some things I don’t like about it. Push notifications are useful, but I can’t stand the daily awkwardness with scrolling and funky text selections caused by Google’s reliance on embedded web views. Support for Gmail is solid and improving, but I miss the butter-smooth animations of Sparrow or, despite its flaws, Mail’s fluidity and native feel. I like Gmail for iOS, but I don’t love it. Last month, I was sent a beta of Triage for iPhone, and a few hours into using it I knew that was it. That was the email app – not a client – that could allieviate my Gmail sorrows while showing a new way to process my inbox on an iPhone. My test for understanding whether a new app can fit into my daily workflow is simple: I have to keep using it. That’s what happened with Drafts, Launch Center Pro, Tweetbot, and many others. If I find myself wanting to use an app without making an effort to remember I have to use it, then I know that app has “clicked” for me. That’s Triage. I’m actually surprised I didn’t stumble across anything similar before. Triage works with iCloud, Gmail, Yahoo Mail, and generic IMAP email services; it lets you configure an unlimited number of accounts; it doesn’t have push notifications, and it doesn’t support the usual folder/label structure of most modern email clients. 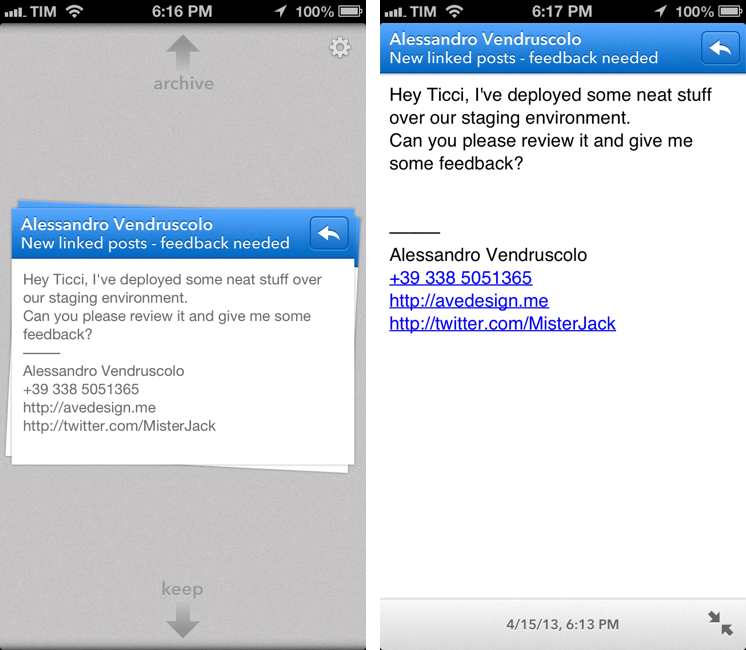 In fact, Triage is not an email client: it’s an app to process your inbox with gestures. The premise is straightforward: Triage wants to complement your primary email client by providing a faster way to archive and keep emails, designed around the iPhone’s screen. Emails are presented as a stack of cards, with a preview showing the sender, subject, and contents of the message. To archive a message, you grab it and flick up; to keep it unread and in your inbox for later, you flick down. And that’s it. From my personal experience, I can say that most of my iPhone email sessions revolve around decision-making. I’m in line at the grocery store with 10 people ahead of me at the cash register, and I check my email: do I want to keep this message or delete it because I don’t care? Or: I’m waiting for my doctor – does this message require an immediate reply or can I just forward it to someone else and forget about it? My iPhone is not my writing device, and therefore I don’t want to type long emails on it. When I check email on my iPhone, it’s because I’m not at home, and if I’m not at home, it means I’m doing something else. Ergo, those few minutes (or seconds) that I can dedicate to my inbox better lead to something more efficient than coming to terms with Mail’s progress bar problems or Google’s weird web view affair. Triage allows me to clean up my inbox so I can later sit down and do the “serious” processing (either long replies or “Print As PDF” for archival purposes) on my iPad and Mac. Triage is easy to use, but there are some settings and options to consider. Each account can be configured to have a custom action for the Flick Up gesture: for instance, your work account can have Mark As Read instead of Archive but your personal one can go straight to Delete once a message is dragged to the top of the screen. Furthermore, you can choose the amount of messages to show in Triage, going from Last 7 Days to 14, 90, or, if you want to see every new message since you last checked Triage, All Messages. I personally prefer to associate Archive with Flick Up and to show All Messages. When you get new messages (Triage comes with aptly color-coded “stamps” for an empty inbox or refresh errors), you can also enlarge them or reply to them. To zoom into a card, tap on it and Triage will bring up a full-screen view of the message with a timestamp and close button at the bottom, and sender/subject at the top alongside a reply button. You can tap on the top toolbar to view a popover with more details such as complete email addresses and date, or you can just hit the button and choose between Reply and Forward. The latter will rotate the screen and request access to your Contacts to add a recipient (the app will use a Fwd: prefix in the subject and let you add an additional message); or, you can reply to a message and move on to the next one. In my four weeks of testing, Triage’s support for Gmail, iCloud, and IMAP has been reliable. The app was fast at fetching and sending messages both on WiFi and 3G, and messages were correctly archived, deleted, or kept in the inbox seconds after I flicked up or down in the app. Every day since I started using Triage, I came back home, grabbed my iPad or Mac, and went through the messages that I had chosen to keep unread in my inbox. There are some things that I don’t like about the first version of Triage. First and foremost, there’s no unified inbox: to check for messages in your accounts, you’ll have to hit the Settings icon in the top right corner and choose a different account every time. Sparrow and Apple Mail got me used to the unified inbox, and I think the feature would be particularly fitting for Triage’s focus on quickly cleaning up your email accounts from messages you don’t want (or prefer to keep) in the inbox. The process of selecting one account after the other has become a routine for me at this point, but that doesn’t mean a unified inbox wouldn’t be a terrific addition to Triage. Also of note in the area of missing features is the lack of support for signatures. Triage 1.0 can’t import signatures from Gmail, and it doesn’t let you set a single, Triage-specific signature for all your accounts. I understand that Triage isn’t primarily built as an email app to send messages, but the feature is there, and I believe the app should have supported at least a single, app-specific signature. Personally, I look forward to seeing tighter Gmail integration in future releases. Other minor gripes I have with Triage include the lack of iOS’ native controls for rich text and inline attachments (the ones you can use in Mail), lack of landscape support for typing, and no support for alternative browsers (links will always open in Safari). There are no push notifications, but I don’t think that’s a notable omission: Triage isn’t meant to help you stay on top on every single message. I’m sure Apple, the Sparrow team, or Google could have come up with Triage. But they didn’t. In a market that’s hungry for full-featured email clients, Triage’s focus is on letting you decide which messages will require more attention later, and which ones can discarded now. Triage is based on a simple, efficient, and rewarding process that works by leveraging the iPhone’s most obvious gesture and one-handed operability. Unlike other new email apps, Triage doesn’t let you scan your inbox to turn messages into to-dos: it uses a one-message-at-a-time approach to see what’s up, what needs attention, and what can be kept for later. The first version of Triage is missing, in my opinion, two important features (unified inbox and signatures), but that hasn’t stopped me from using the app every day, every time I didn’t have access to my “full” email client. Now, I even use Triage when I’m already in front of my Mac because I like to “prepare my inbox” with it. Triage has helped me tackle my daily inbox problem by removing features and replacing buttons and fancy menus with a simple flick of the finger. It’s my new favorite email app. Triage is available at the $1.99 on the App Store. Go get it now.